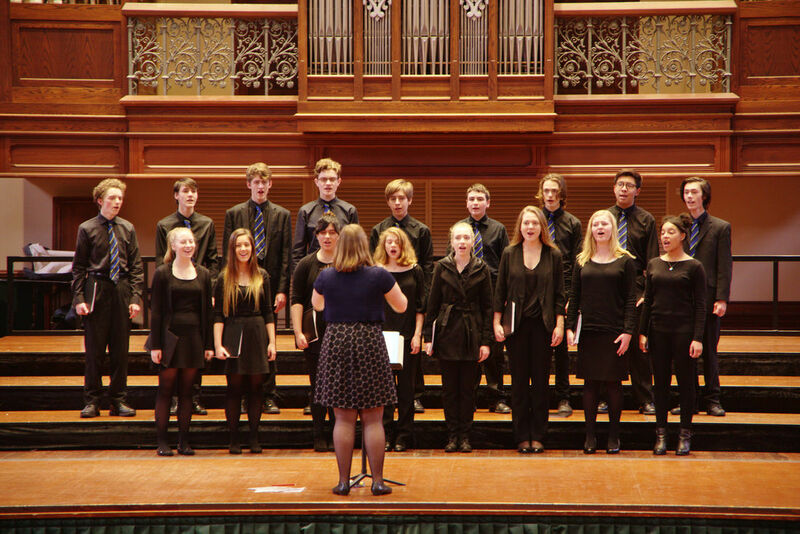 On the 24th of November, the tour choir and big band embarked on our journey to Scandinavia, touring Sweden, Finland and Norway over two and a half weeks. It was an amazing mix of getting to sight-see and explore these incredible countries and also getting to perform and interact with students who are our musical counterparts on the other side of the world. We were keen to experience the much acclaimed Scandinavian education system for ourselves. After 20 hours of flying, we landed in Stockholm, Sweden, and headed straight to the ABBA museum. Any signs of tiredness quickly disappeared and were replaced with a few interesting renditions of Mamma Mia and Dancing Queen in the karaoke booths. After a bus tour of the city, we flew to Oulu, a city in Northern Finland – finally sighting snow, which sparked major excitement in the group! We then drove to Rovaniemi to begin our Finnish winter experience, where we drove husky and reindeer sleds in the Arctic circle, met the huskies, got driven in a snow mobile through the forest and had many snowball fights. Each of the activities was as surreal as the next. The evening was spent in the middle of the snowy forest, sitting around campfires while sharing stories, toasting marshmallows and drinking hot juice, before heading to our beautiful chalets for the night. The next morning, we cooked our breakfast within the chalet groups - some groups made bacon, egg and cheese rolls while others opted for the microwave pizza option. That day, we visited Santa’s village in Lapland, and Santa himself, which was straight out of a fairy tale. We had a surprise trip to the ice hockey that night which was an incredibly unique and exciting experience. 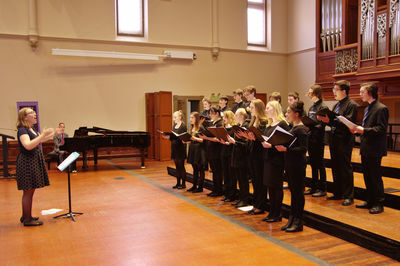 Our first school interaction was with the Oulu high school, a music school comprised of only 300 music students. Our big band and their big band combined to create 2 mixed bands, while we also had a combined choir made up of Australian and Finnish students. We faced our first challenge of having to quickly learn music in Finnish. The Finnish students would help us with our pronunciation and vice versa, and then we all bonded over lunch in their cafeteria - which was a novelty for us. It was amazing how quickly and easily we were able to interact with the other students, who were all extremely friendly and welcoming. They were keen to learn about Australia, as we were about Finland. Our similarities were many, despite living on opposite ends of the world. The following day we performed with the students to the rest of their school, to an energetic, receptive audience. We then gathered on stage for a photo and to exchange gifts, and their principal noted how incredible it is that our schools are on opposite ends of the world, yet we do the exact same thing and can come together and make music. It was such a memorable day and we each felt a really special connection with the school. Our school interactions continued throughout Kuopio, Espoo, Helsinki, Oslo and Lillestrøm – Brighton’s sister school. 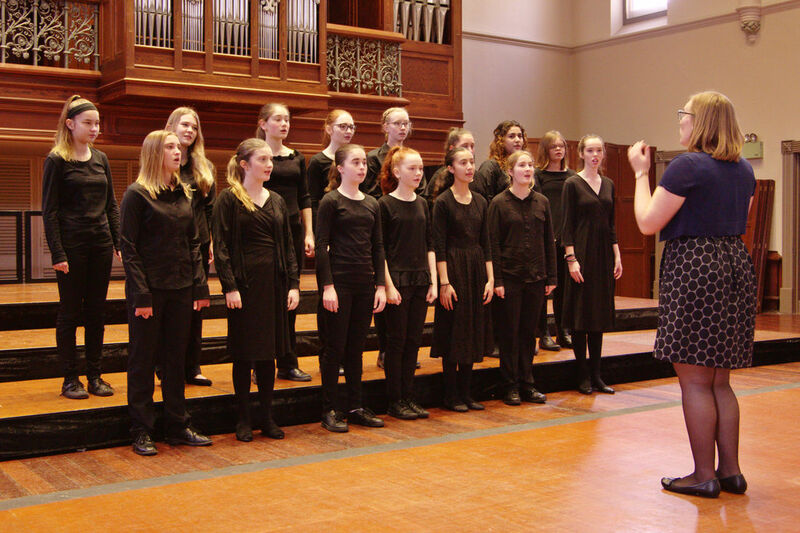 Each of our audiences were as positive and responsive as the next – we even taught the Finnish students the Nutbush. In Helsinki, we explored the city with our tour guides, visiting the rock church and the Sibelius Music Institute. That evening, we performed two items in the Finnish Independence day celebrations, ‘O Nata Lux’, and ‘Finlandia’ in collaboration with the Finnish students. It was an honour to be a part of the independence day concert, and our performance did us and Brighton proud. Our final day in Finland was spent performing at a primary school, then visiting the Fazer chocolate factory, where we had a tour and explored the many interactive activities. We were set free on a chocolate tree that was filled with mini samples of the different chocolates. We then said goodbye to Finland and flew to Oslo, Norway, where we visited the Holmenkollen Olympic ski jump and museum - the highest point in Oslo, where we had yet another snowball fight. The Christmas market was beautiful to look at, and gave us a whole new Christmas experience to what we have in Australia. That evening, we performed in collaboration with the Lillestrøm school’s choir in their Christmas concert, singing ‘O Holy Night’ and two Norwegian Christmas carols. 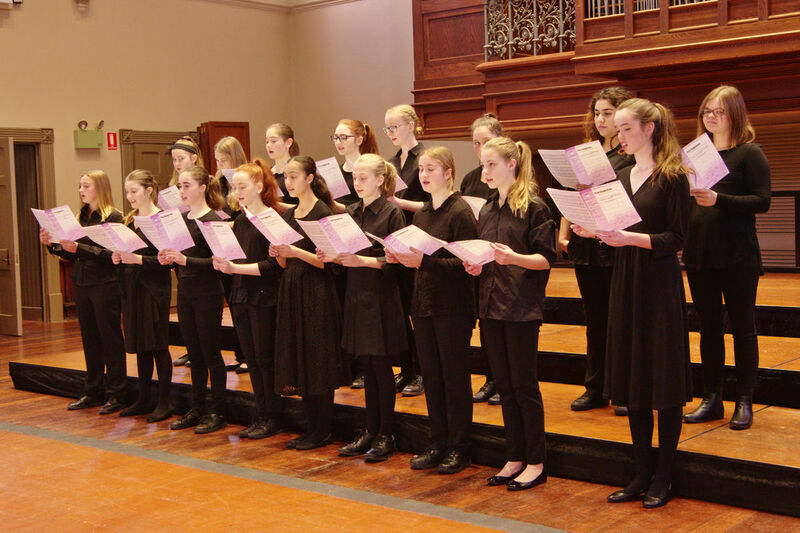 The next day – and the final full day of our tour – we returned to the Lillestrøm school for our final performance. We had a small audience of the school’s music students but this made the performance even more fun and comfortable. The big band played their entire set, followed by the choir with four of our most upbeat songs, making for a very memorable final concert. After the performance, we said goodbye to our new friends in Lillestrøm, gifting them koala key rings as a memento. After visiting the Vigeland sculpture park and Viking museum, we had our final dinner on tour which was delicious pizza brought straight out of the oven. As a thank you to the chef and waiters we sang ‘Land Down Under’. We then walked back to the hotel for our ‘end of tour celebration’. The next day we began our long journey home before arriving in Adelaide in the evening of the 10th of December. It was an incredible tour, and we accomplished more then we ever thought possible. These music tours are invaluable, leaving us with many new friends from both within our choir, but also across the world, as well as experiences that are once in a lifetime, made even more special when surrounded by a group of dedicated, enthusiastic, fun people. Getting to workshop, perform and connect with students in other countries is very special, and gives us a chance to see how music can bring us together despite living on opposite ends of the earth, as well as helping us grow in confidence and as musicians. In order to provide our students with a real world learning context, my Year 10 Musicianship class has spent the semester working together on designing and presenting a Kindermusik class. The activities the students are designing are based on Early Childhood music pedagogies such as Kodàly, Orff and Dalcroze. We invited Kindermusik instructor, Deb Johnson who came with her twin boys, to demonstrate the structure and purpose of a Kindermusik class. This was a highly useful activity in casting vision and setting a context for our students’ learning. The Year 10 Musicianship will be presenting their Kindermusik class to the students of Somerton Park Kindergarten later in the term. In Week 8 of Term 3, music students visited Emali Early Learning Centre to run a music workshop with the kindergarten students. Year 8 students Casey Gulliver and Tori Munn were the stars of the show, playing a number of songs on viola and cello to a very excited audience of 1-5 year olds. Casey and Tori also worked with Miss Simmons to do some musical activities, dance and singing with the children, and showed wonderful leadership and community spirit - well done, Casey and Tori! Brighton music students will have further opportunities to perform at Emali this year, as this is a wonderful opportunity to engage with the local community and share our love of music. 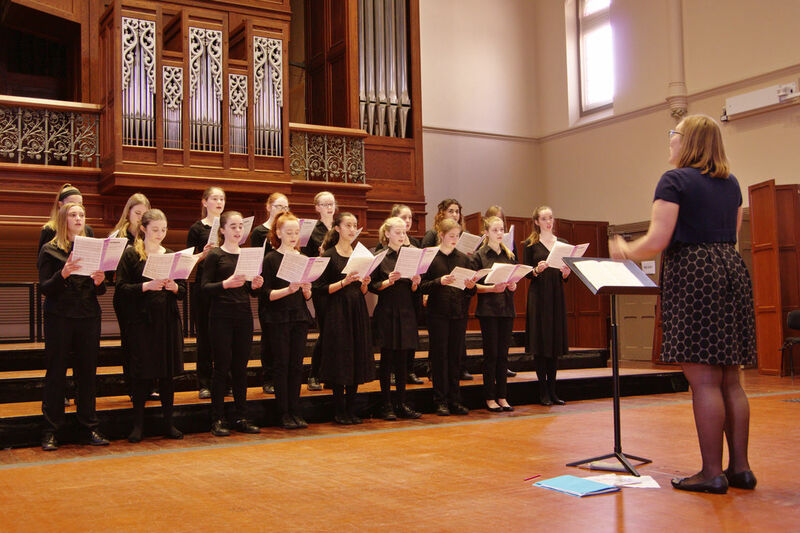 Students studying the recorder with DECD Instrumental Music were provided the opportunity to meet and work with Australian internationally acclaimed recorder player Genevieve Lacey. Genevieve is a recorder virtuoso, collaborator and artistic director, with a significant recording catalogue and a career as an international soloist. Genevieve is the recipient of two ARIAs, a Helpmann Award and Australia Council and Churchill Fellowships. Her performances have included playing for the Queen in Westminster Abbey, representing Australian culture with a performance at the Lindau International Convention of Nobel Laureates and as soloist with the English Concert and Academy of Ancient Music. Approximately 30 students from seven DECD primary and secondary schools attended Marryatville High School last Wednesday to participate in a workshop with Genevieve. Genevieve shared stories regarding her career and answered many questions from the students regarding her experiences. She demonstrated many beautiful sounds on a wide range of priceless instruments. She also worked with students on techniques specific to advanced recorder playing and guided them through some Renaissance dance music as a large ensemble. The following day students were invited to attend an open rehearsal at the Adelaide Symphony Orchestra’s Grainger Studio where they watched Genevieve rehearse with the ASO in preparation for the upcoming concert. Genevieve also found the time to interact with the students and talk with them regarding the repertoire and her performance. Genevieve’s time, effort and genuine interest in the students was a true highlight. Her kindness towards the students as well as her support of their playing and musical development made the two days extremely meaningful and beneficial. Bringing together 30 recorder players created camaraderie and created new friendships. Students gained new confidences and an appreciation for the pathways available to them as recorder players. On the 13th of September, Year 12 piano students Serena Duke and Esmond Choi, along with myself, had the opportunity to engage in a special master class with French concert pianist Jean-Efflam Bavouzet. He workshopped our pieces before a small audience of students and individuals from the community, sharing fascinating insight into various strategies and techniques to improve our overall performances. Speaking passionately about elements of music such as layers and dynamics, his advice proved to be applicable to each of us and transferrable to other instruments as well. After hearing us play and imparting wisdom regarding our pieces, he proceeded to play a few pieces himself – his rendition of Debussy’s ‘Reflets dans l’eau’ from his first volume of Images being particularly memorable, casting elegant imagery in the mind of the audience. Bavouzet captivated us with his playing and his knowledge, enabling us to move forward with our pieces with new information, and additionally, a renewed drive to improve the quality of our performances. While Term 3 was incredibly busy for music staff and students, the two Music Spectacular concerts were undoubtedly our main focus. In these matinee and evening performances on Saturday 26th August 2017, we took the themes 'The Americas' and 'European Vacation' as far as possible, transforming the foyer and Concert Hall into a departure lounge and 400-seat Dreamliner as we took audiences on a journey to faraway destinations. It was a massive team effort and I wish to congratulate all involved for their contributions. On the 16th and 17th of August, Brighton Performing Arts Centre played host to the Essentially Ellington Down Under Regional Festival. Big Bands and big band directors from around South Australia were invited to attend the competition, band workshops and professional development sessions featuring members of the from Jazz at Lincoln Center (New York). This year is the first time the event has been held in South Australia. Our bands were fortunate to have a private workshop with two incredible musicians, adjudicators, and educators - Vincent Gardner and Jerome Jennings. Year 9 student Matthew Adams was particularly lucky to receive a private drum lesson from Jerome Jennings for an hour after the rest of the students had left for the day. On August the 10th, Brighton Secondary School hosted 60 Year 5 students from primary schools across the Southern region. For two hours, the beginner band and the Brighton Secondary Year 10 band played together. Here the junior instrumentalists were provided with the opportunity to meet Year 10s who played their instrument and for the two bands to play pieces such as Fantasy Fiesta, Popcorn Prelude, Ghosts in the Hall, and Tyrannosaurus Rocks! It was a wonderful experience for both the Year 5s and the Year 10s to play to each other and to provide support for each other. This was a great opportunity for the grade 5s to see the long-term benefits of playing a musical instrument and for them to see what can be achieved by continuing to study music into the future. After the success of the morning, we are hoping to continue to hold this event in future years. On the 31st of July, the Brighton String Ensembles were fortunate to spend the day working with Dr Quinton Morris. Dr Morris is the Director of Chamber and Instrumental Music and Associate Professor of Violin and Chamber Music at Seattle University, and travels the world performing solo recitals and teaching thousands of students. Dr Morris challenged the students in Year 8, 9 and 10 and took them out of their comfort zone. He pushed them to play with more energy and commitment, with outstanding results. It was amazing to see how he brought the pieces to life, making connections between the historical context of each piece and our current experiences. Later in the day, students witnessed Dr Morris demonstrate his teachings in a practical setting during a lunchtime recital with pianist Ashley Hribar in the Concert Hall. Dr Morris truly embodied the commitment to performance, energy and expressiveness that he had described in the workshops, and no doubt inspired many of our string students to continue striving for excellence in their playing. On the 25th July, a group from the Royal Society for the Blind attended a concert presented predominantly by Year 9 Core Music students. In their debut performance for the year, the Guitar Ensemble directed by Mark Cameron-Smith performed at the Brighton Church of Christ on the 8th August in conjunction with Stephen Badger, Esmond Choi, Emma Richardson and Jim Zhang. 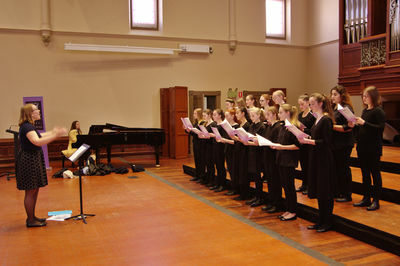 In a regular calendar event for Brighton Secondary School, seven of our SACE students (Esmond Choi, Alevia Evci, Olivia Hallam, Jessica Hok, Charlotte Rayner, Yoni Rex-McGirr and Emma Richardson) performed for the LINKAGE group at the Holdfast Baptist Church to hone their skills before their performance exams. Finally, the Amoroso String Quartet and Alex Witty performed in the foyer of the National Wine Centre, for the annual SASPA (South Australian Secondary Principals’ Association) Conference on the 16th and 17th August. 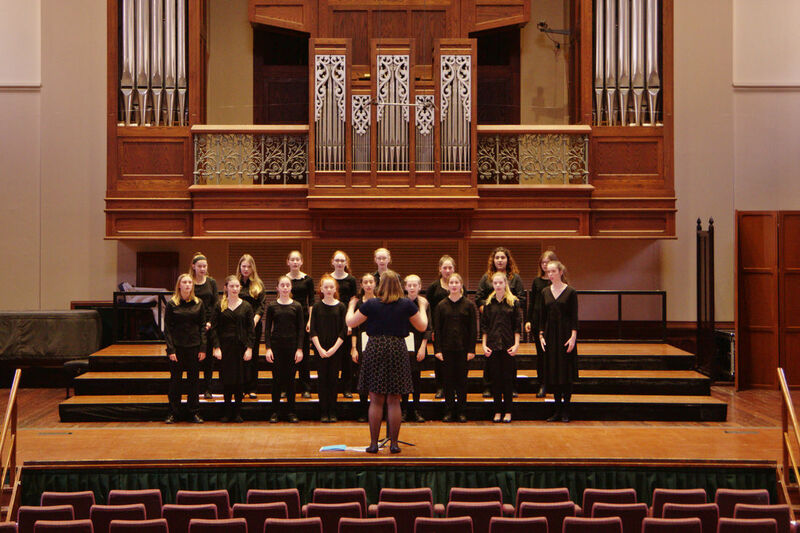 On the 29th June, one of the most inspiring events ever staged by the four Special Interest Music Centres, this 40th Anniversary Concert in Adelaide Town Hall left the audience with nothing but praise and admiration for these dedicated students. Brighton students were involved in the Combined Brass Ensemble, the Combined Orchestra, the Combined Choir and Brighton’s Big Band 1. Billy James and Mark CameronSmith worked tirelessly behind the scenes directing the combined stage crew. 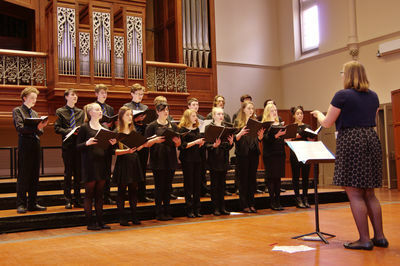 On Saturday 24th June the annual Chaplains’ Concert took place in the Brighton Concert Hall. Roland Dankbaar conducted Brighton’s Sinfonia in a dazzling first half which included Vivaldi’s Concerto in D Major featuring: Niamh Michael-Roubos, John Knott, Michaela Sales and Mina Johansson on violin; Alison Marton on cello; Spencer Marshall on double bass; Jereyll Chia and Ben Cook on violin and harpsichord; and Leah Komad-Antic on harpsichord. The second half of the concert was presented by the Brighton Secondary Symphony Orchestra in a program strongly linked to the theatre. Special mention must be made of soloists Esmond Choi and Jim Zhang, and compere Duncan Vecchiarelli. 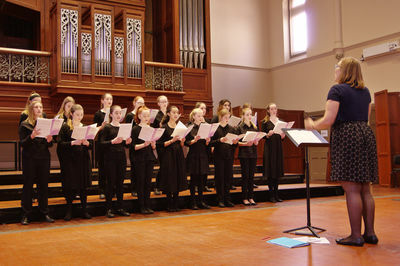 ​On Wednesday 10th May, we had the honour of performing at the Volunteers’ Morning Tea at the DECD Centre Gallery, Adelaide. This event allowed DECD to officially recognise the invaluable contribution made to the organisation and the community by volunteers. The six students involved (Lucas Horta, Hanz Matutina, Matthew Stone, Emma Richardson, Jess Hok and Serena Duke) were grateful for the opportunity to perform their solo repertoire to a very appreciative audience in preparation for their performance exams at school. On April 8th 2017 rock band Experiment One took out the 2017 Murray Bridge Battle of the Bands. This prolific young group that includes three Brighton students (Ben Waltho, Charlie Waltho and Isaac Byrnes) blew away the opposition to win $1000 worth of studio recording time. The group aims to follow up on their first EP, Tic Tacs and Mardi Gras, recorded last April and released in September, 2016. ​In their first official performance, the 2017 Tour Choir braved the early Tuesday morning of April 25th in the middle of the school holidays to sing at the ANZAC Day Dawn Service at Brighton Jetty. As is the tradition at this solemn occasion, the choir sang four hymns, O Valiant Hearts, Abide With Me and the national anthems of Australia and New Zealand. 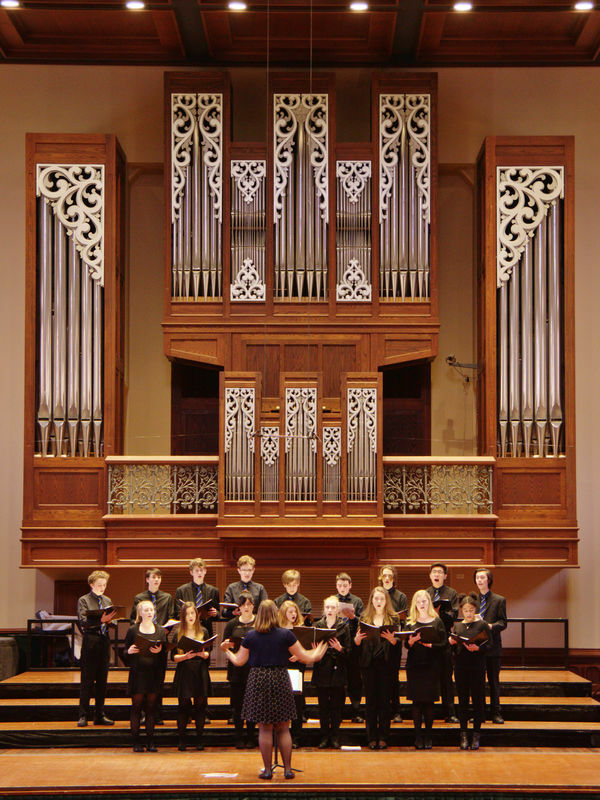 On Wednesday 29th March, eight senior students performed as part of the Recitals Australia Lunchtime Concert Series in Pilgrim Uniting Church, Adelaide. Stephen Badger, Jim Zhang, Tim Braslavskiy, Esmond Choi, Emma Richardson, Kiran Sachdev, Lauren Owens and Charlotte Rayner presented a varied program, which was recorded by 5MBS and will be broadcast at a later date. On Wednesday the 22nd of March, the Amoroso String Quartet (Emma Richardson, Lauren Owens, Kiran Sachdev and Charlotte Rayner) performed at the Beauty and the Beast premiere in Glenelg’s new Greater Union Film House. We entertained over 150 guests who attended the special “Chicks at the Flicks” event, which included food and drink, market stalls and prizes. 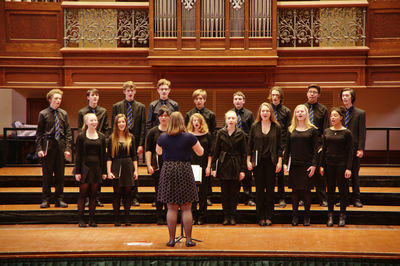 It was a fantastic atmosphere in which to perform and we were honoured to represent our school in the local community. ​In a real Term 1 treat, the Elder Conservatorium Chamber Orchestra performed for our students on Thursday 16th March in the Brighton Concert Hall. 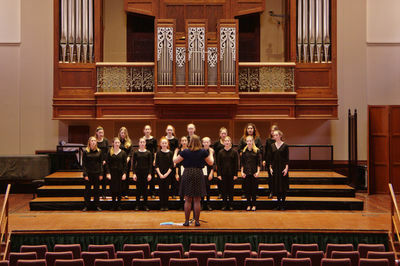 Directed by Head of Strings at “The Con”, Elizabeth Layton, and including Old Scholars, Harriet Davies, Lilla Davies-Ardill and Mae Napier-Traeger, the orchestra presented a dazzling program of Mozart, Neruda and Grieg. On Tuesday the 7th of February 2017 Big Band 1 performed in the gardens of Government House as guests arrived for the 2017 SACE Merit Ceremony. We were extremely fortunate that this outdoor event took place on the one day of the week that was not raining or extremely hot. Congratulations to Esmond Choi, Lilla Davies-Ardill, Christopher McDonald and Kimberly Wong for achieving merits for Stage 2 Music subjects. On the 17th of January 2017, I had the honour and privilege to perform the Australian National Anthem at the Stage 3 Opening of the Tour Down Under. It was a wonderful opportunity to be a part of such a large community event which is not only known nationally but internationally as well. This was a truly proud moment and one I will never forget.